GOLD PRICES rose to 3-week highs against a weakening US Dollar on Thursday, trading up to $1209 per ounce in London's wholesale bullion market as equities rose together with commodities and US Treasury bond prices. As the Dollar eased back – most notably versus emerging market currencies led by the Turkish Lira after a shock interest rate hike – silver also gained, halving the last 2 weeks' loss to trade at $14.30. Platinum prices spiked to $810 per ounce, the highest level in a month. All three precious metals have seen speculative money managers place record bearish bets using Comex futures and options contracts over summer 2018, leading some analysts to predict a "short covering rally" if prices fail to fall further. Istanbul's stock market meantime rose 1.5% on Thursday, extending its rally from August's near 18-month lows, after the Central Bank of the Republic of Turkey hiked its main interest rate by over 6 percentage points to more than 24% per annum, the highest cost of borrowing in 15 years. With gold priced in Dollars also rising however, domestic bullion prices in the world's No.5 consumer nation retreated only to TRY 230 per gram, albeit 15% below last month's new all-time highs. Looking at developed-world stock market, "Investors do not seem prepared for anything but a continuation of the current upward trend, something that is hard to fathom if US tariffs on $200 billion in Chinese goods go into effect," says a note from US investment bank Morgan Stanley's head of investment and portfolio strategies for wealth management Lisa Shalett. Short term, "We see gold as oversold and the likely beneficiary if recession fears rise," she says, advising clients to think about "tactically deploying" 3-5% of their portfolios towards the metal. 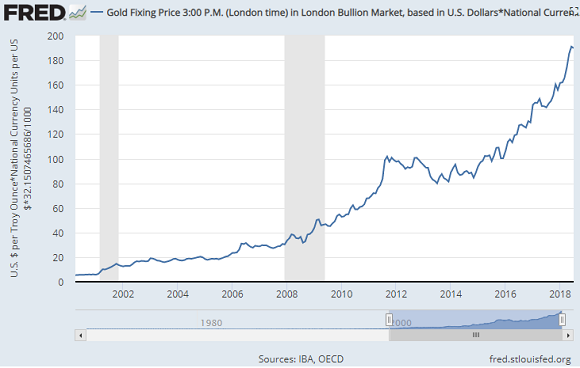 Long term however, "Gold has not proven to be a good inflation hedge...[its] correlations with stocks and bonds are unstable...[and Morgan Stanley] no longer views gold as a strategic asset class, as it provides no interest or yield – and in the case of physical gold, there is a cost to store it." Shalett in mid-May said broader emerging markets looked "a good place to invest." The MSCI Emerging Markets index has since lost 14% of its value. "The Dollar is close to peaking" she told Bloomberg in mid-June. It has since risen nearly 3% against the world's other currencies, recovering January 2017 levels. Jumping sharply on today's CBRT news to reach 3-week highs near 6.0 per US Dollar, the Turkish Lira had earlier sunk ahead of the central bank's decision, coming with 5% of last month's new record low, after President Recep Tayyip Erdoğan – who yesterday put himself and his son-in-law in charge of Turkey's sovereign wealth fund – called interest rates a "tool of exploitation", repeating a phrase which helped spur the currency's plunge in mid-August. "If and when the prices fall back to the low TL200's or below," wrote specialist analysts Metals Focus in a note late in August, "we believe that [Turkish] investors will start buying again. "[But] weakness in the Lira will persist and Dollar gold prices will also rebound. 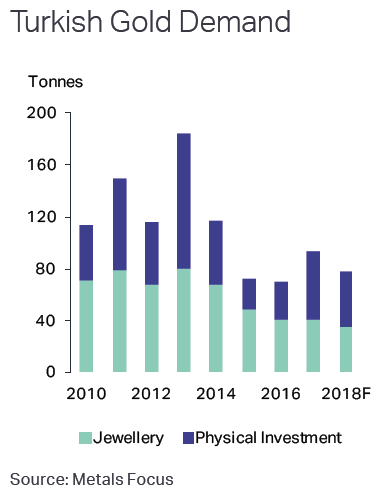 "This suggests that disinvestment, as well as scrap, will grow this year while jeweller demand [for fabrication] is likely to post a double digit decrease." The Euro and British Pound were meantime little changed Thursday after their central banks made no change to their monetary policies, keeping their main rates at 0.00% and 0.75% respectively. The Bank of England's short statement kept the stock of quantitative easing asset purchases at £445 billion and referred twice to "greater uncertainty" about the UK's March 2019 Brexit from the European Union. The European Central Bank repeated its plan to reduce and then end its new monthly QE purchases between now and New Year, before maintaining that €2.5 trillion stock of assets "for an extended period of time...to maintain favourable liquidity conditions and an ample degree of monetary accommodation." The UK gold price in Pounds per ounce rose back towards last week's finish at £924, and the Euro gold price held unchanged from the last 1, 2, 3 and 4 weekends at €1036.